Everything you know is wrong. 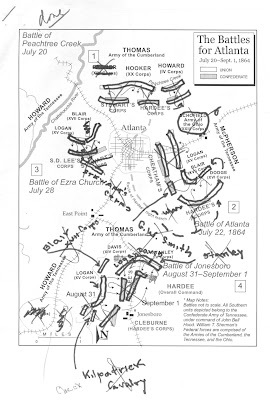 . .
Two entries below, I posted a map of the battles for Atlanta (here). I wonder how many die-hard students of that campaign went rushing to their books to challenge or confirm one or more elements in the draft. 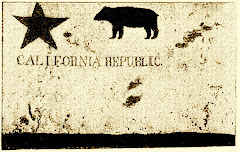 It finally dawned on me, as I glanced at the map again, that it was an early version. The folks at the Library of Congress sent that version to Ed Bearss for his input, and in case you're wondering, here's what the map looked like when Ed sent it back (click to enlarge). As you can see, he had a couple problems with my unit designations, and alignment. As I incorporated each change, I crossed it out, which accounts for the large x's. I wasn't too far off, but far enough to skew things had the unedited version gone to press. My initial draft was based on deep reading of the campaign, but still something short of expert. This is why manuscripts, and maps, should be scrutinized by the most authoritative people available — someone capable of spotting the problems. 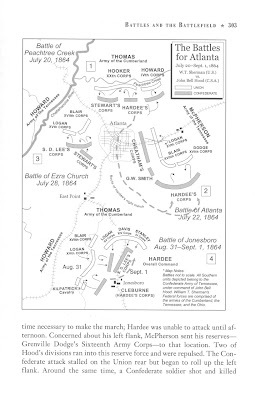 This last map is the revised version that appeared in the published book. Ah, now that's better. 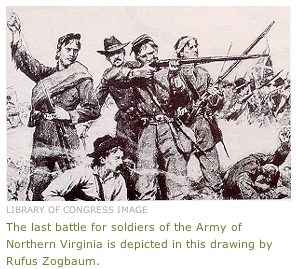 and a weekend at Appomattox for the 11th Civil War Forum Battlefield Conference. I'll be back online in a few days with photos and tales of my adventure in rural Virginny.